Jeffrey M. Nye, a partner of the law firm of Stagnaro, Saba & Patterson, was recently appointed to the Anderson Township Board of Zoning Appeals by the Anderson Township Trustees. Jeff concentrates in commercial, construction, and real estate litigation. Read More About Jeffrey M. Nye here. Stagnaro, Saba & Patterson’s shareholders Peter A. Saba and Paul T. Saba have received honors among the city’s Super Lawyers®, a Thomson Reuters designation based on professional achievement and peer recognition. Peter Saba and Paul Saba were recognized as Cincinnati Super Lawyers® Top Rated Business Litigation Attorneys. Paul Saba concentrates his practice in commercial litigation, real estate litigation, creditor’s rights, construction litigation, receiverships, and corporate law. With Paul’s years of experience and business background, he acts as a valued business partner for his clients and provides them with well-developed legal solutions. Peter Saba concentrates in Business Litigation, Employment & Labor, Employment Litigation, commercial law, real estate, probate, probate litigation, real estate litigation, wrongful death, medical malpractice and products liability. Peter has litigated, tried and argued cases before the federal courts, courts of common pleas, courts of appeals and Supreme Court of Ohio, as well as the federal court, circuit courts, and court of appeals for Kentucky and the circuit courts in Florida. Best Lawyers recently released the 2019 edition of The Best Lawyers in America© publication and we are thrilled to announce that four of our attorneys have been selected. The lawyers were selected for their work in Real Estate Law, Business Organizations, Closely Held Companies and Family Business Law. "A well-earned recognition. For 23 years, we have stayed true to our values, focusing on achieving the best possible results for our clients by providing outstanding work and client service," said the firm's Shareholder, Peter A. Saba. "Our clients deserve nothing but the best." Best Lawyers is a consumer guide that lists the leading attorneys in each practice area and metropolitan region developed from peer-review surveys. According to the Best Lawyers website, the selection process "employs a sophisticated, conscientious, rational, and transparent survey" to ensure a meaningful and useful list. The methodology is designed to capture, as accurately as possible, the consensus opinion of leading lawyers about the professional abilities of their colleagues within the same geographical area and legal practice area. Stagnaro, Saba & Patterson Co. LPA is pleased to announce that it has named three new partners: Jeffrey M. Nye, Jeffrey J. Cornwell and Lisa M. Rammes. “We couldn’t be prouder of these three talented professionals who have a passion for the practice of law and have served our clients in an exemplary way,” said Peter Saba, Shareholder. Read more here. Stagnaro Saba & Patterson’s shareholder Paul T. Saba has received top honors among the city’s Super Lawyers®, a Thomson Reuters designation based on peer recognition and professional achievement. Saba was included in the Cincinnati Super Lawyers® Business Litigation practice area list. He concentrates his practice in commercial litigation, real estate litigation, creditor’s rights, construction litigation, receiverships, and corporate law. He applies his business degree and vast and dynamic legal experiences to develop creative legal solutions and act as a valuable business partner for his clients. U.S. News & World Report and Best Lawyers® named Lisa Rammes a 2018 Best Law Lawyer for Business Organizations (including LLCs and Partnerships). The Best Lawyer distinction recognizes the top 4 percent of practicing attorneys in the U.S.
"We are proud to receive this prestigious ranking for our business practice area," said Shareholder, Jeff Stagnaro. "We are passionate about delivering outstanding professional service to shareholders, partners, and members of all businesses we represent. We are extremely honored to receive this recognition for Lisa and appreciate the great work Lisa does for our clients." VIEW PHOTO We are excited about our fall volunteer project - raising money for Lifting Kids, a non-profit serving kids in Guatemala. A little background on why this organization is so special to us at SSP. Jeff Stagnaro’s daughter, Emilee, and her husband, Daniel, founded this non-profit in 2014. Daniel is Guatemalan and they met while doing mission work in Guatemala. Lifting Kids is a Christian after-school program in San Mateo, Guatemala (an isolated mountain village). The program serves meals to kids in poverty, about 60 kids. The kids also attend classes in Bible, math, reading and English. We are raising money to provide food, school supplies and clothing for the kids. We have some incredibly exciting news to share with you! 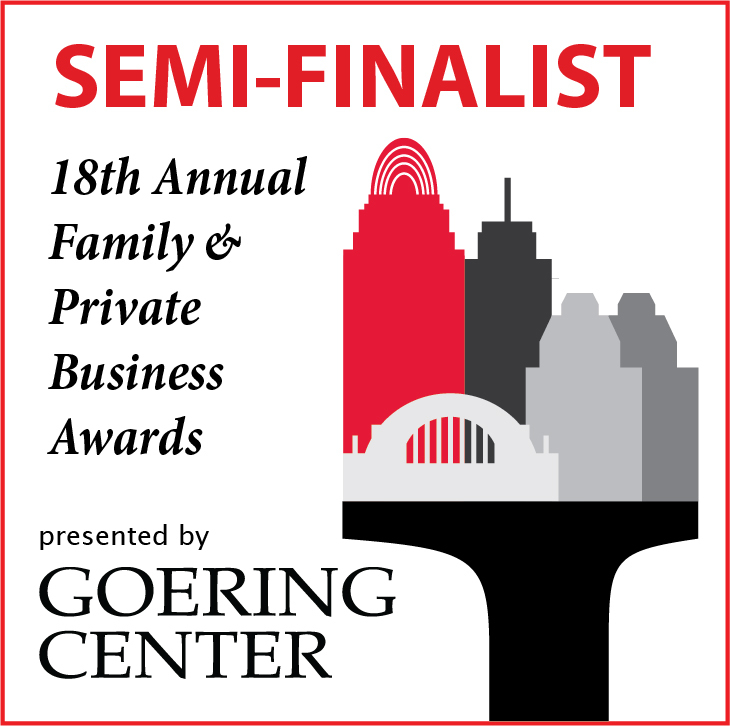 SSP has been named a 2017 Goering Center Family and Private Business Award Semi-Finalist. We are one of only 75 companies from more than 500 nominees to be named a semi-finalist for this prestigious award. This annual recognition is in its 18th year and honors Cincinnati regional businesses that exemplify the best in family and private business practices. We appreciate your continued support and simply couldn’t be the company we are without our clients, friends and family.